P.G. 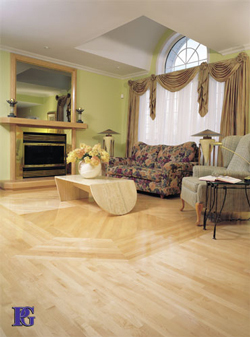 has been manufacturing hardwood flooring strips since 1979. When it comes to quality we are very demanding, as we know that you are as well, and your satisfaction is extremely important to us. Using state-of-the-art equipment and cutting-edge technology, our mills produce only the highest quality hardwood flooring. P.G. hardwood easily meets the grading standards of both the U.S. and Canadian flooring industry, and is a perfect choice for either residential flooring or sports needs, from gymnasiums, racquetball courts and fitness centers to dance floors and stages. At P.G. we are also renowned for our ability to solve problems with sports floors. Clients often turn to us for difficult corrections to existing flooring. Years of experience and advanced technology make us your best option for new flooring and for improvements to existing floors.